This small-size receiver is intended to receive signals covering the HF frequency band 0.09MHz to 55MHz, and also (with the help of external filters) to receive frequencies up to 800MHz whilst working together with a PC. It incorporates direct digital signal sampling by utilising a high speed analogue-digital converter. Such architecture allows the user eliminate additional noise caused by analogue cascades and makes the signal sound more natural and transparent. The Local Area Network (LAN) interface allows you to use the device remotely and also allows you to connect several receivers to one PC simultaneously. 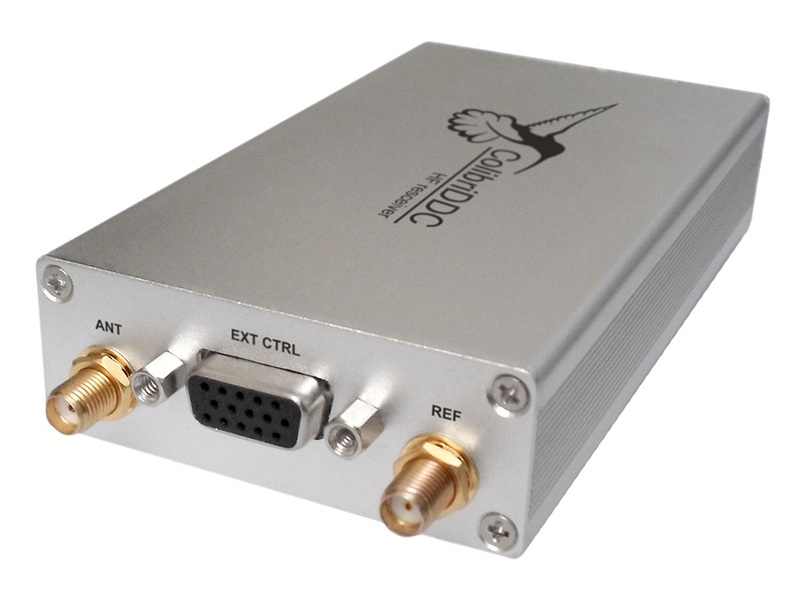 The ColibriDDC is a great low-cost HF and 6m receiver that makes the absolute most of direct sampling technology. ExpertSDR2 program with adapted interface for the receiving mode is used together with the ColibriDDC receiver. At the present moment software works in the receiving mode and maintains two independent channels with the bands to 312 kHz. DSP library, developed by the company Expert Electronics, allowed to improve the receipt quality and to higher the software reliability. Two OS are supported: Windows 8 and Linux Ubuntu.